• Reduction in fuel cell cost by development of reduced platinum loading electrodes and new catalysts which are precious metal free. • Better understanding of the degradation mechanisms known to operate within fuel cells but which are relatively poorly understood and parameterised. • Poisoning of catalysts by environmental contaminants (especially as the catalyst loading is decreased) and mitigation strategies for these effects. This work package seeks to understand these three issues through development of new materials, modelling and accelerated test regimes under relevant operating conditions (temperature, pressure, humidity, reactant concentrations) and endeavours to identify remediation techniques that can be used on fuel cells once they have been exposed to irreversible poisons. Optimisation of stack design and characterisation of materials. The area of focus of this research aims to improve the durability and reliability of fuel cell energy sources by better system integration and design optimisation, coupled with effective health management to maximise the life of the power source. This project aims to develop corrosion-stable support materials for Polymer-Electrolyte Fuel Cells and Electrolysers to mitigate a key degradation mode that limits the lifetime of these devices. Currently the best supports are made out of carbon, which slowly corrodes in the hot, acidic, oxidising environment. The project seeks to this carbon with inorganic carbides, which are more resistant to corrosion. This should make fuel cells work longer and electrolysers cheaper to make. 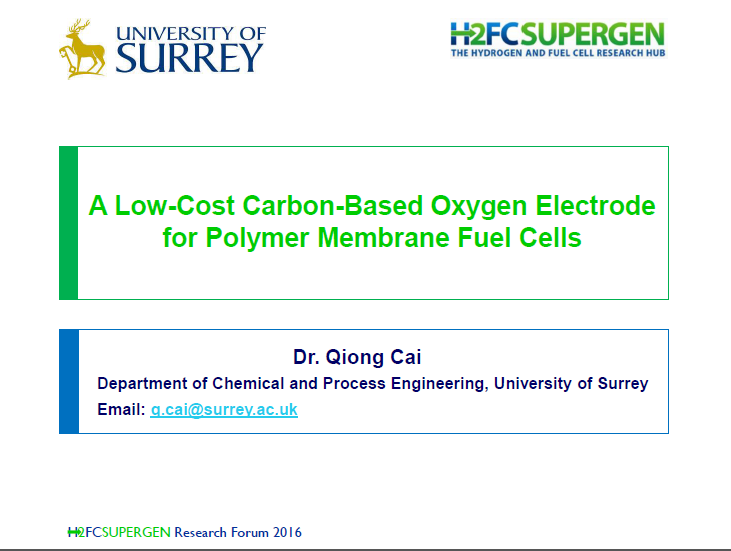 This project aims to develop noble-metal free, carbon-based catalysts, to make significant advancement for polymer electrolyte membrame fuel cells (PEMFCs). This would provide a low cost, environmentally sustainable, high performance energy technology solution. With optimised carbon catalyst, the PEMFCs are expected to have improved cycling and steady state durability. – Production of microelectrokinetic model for the hydrogen reaction which describes performance of platinum based electrodes across applied potential, pH, hydrogen concentration and temperature using four kinetic parameters. This model is used to simultaneously fit results for 19 independent experiments. – Production of a microelectrokinetic model for the oxygen reduction reaction which describes performance of platinum based electrodes across applied potential, temperature and oxygen concentration. These models are used to understand deviations of the ORR from standard models. 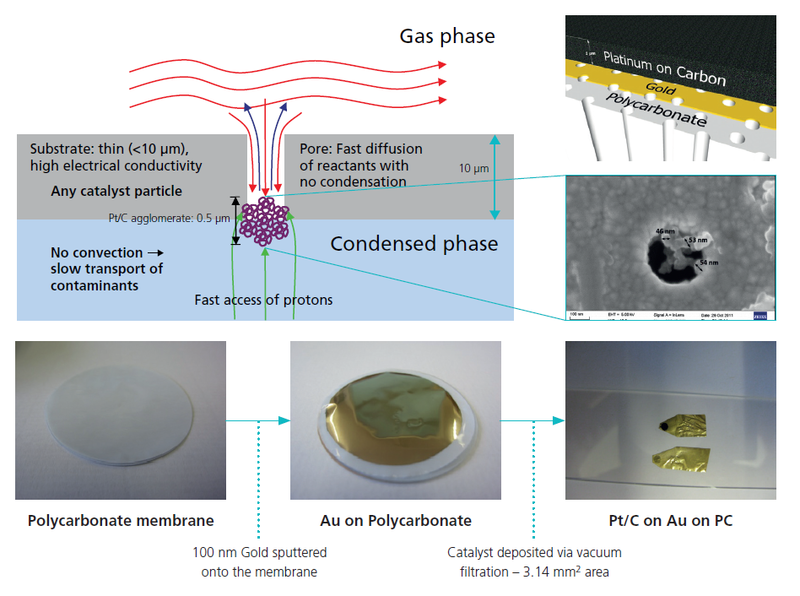 This project has shown how the experimental approach developed can be used to study catalysts for electrolysers The researchers have also developed a prototype water electrolyser utilising only 20µg cm-2 of precious metal. Zalitis, C., Sharman, J; Wright, E, Kucernak, A. “Properties of the hydrogen oxidation reaction on Pt/C catalysts at optimised high mass transport conditions and its relevance to the anode reaction in PEFCs and cathode reactions in electrolysers, ” Electrochimica Acta, 176 (2015), 763-776.